At the end of September, despite forgetting to count up the baking project as I went along I had managed to get to 38 bakes out of a planned 52. This was the point where the project nearly fell apart with me starting to forget to take photos of things. If I bake and don’t take a photograph, did the bake exist? 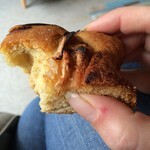 This is a photo of almost the last bite of a cake made with some windfall cooking apples. 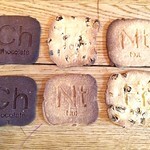 I couldn’t resist these periodic table style biscuit cutters when I saw them, the biscuits I made with them were very ordinary though. Not even everyday ordinary, just not right nice.